Home › Events › April BIKE NIGHT!! 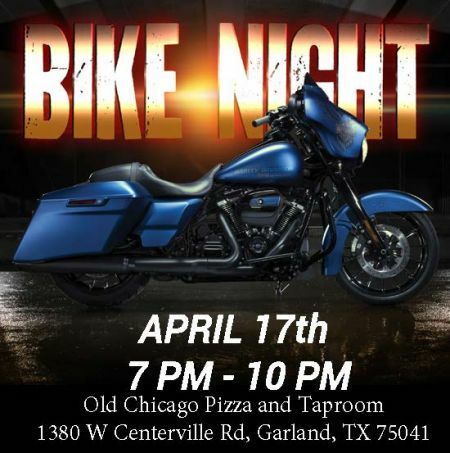 Ride on over to Old Chicago in Garland Texas for the Dallas Harley-Davidson® bike night event, we will be joining The Lita’s of (Kaufman County) Our DHOG Family and Partying with Corona's Promotional team. Wednesday, April 17th. Great food, drinks, raffles, party times, hot chicks, hot bikes - you name, we'll have it. Don't forget to enter to win a 2019 Harley-Davidson Street Bob. *Some restrictions may apply. See dealer for details.